The film tries to pack too many punches in one. If you are DDLJ fan like about a million or more others in this country, chances are that you’ll be drawn to Dilwale for a nostalgic rush. And nostalgic rush there was-only it didn’t come from the grand union of Simran and Raj, but from Mani (Johnny Lever). The timeless comedian’s rant in a strong South Indian accent invokes a memory from his iconic scene in Khiladi pleading for his ‘chota chota bachcha’. The fact that we choose to address Lever’s antic before getting to the big sells must tell you something about the film. Coming back to Raj and Simran or Kali and Meera as they’re in Dilwale, their love story has met its natural fate- the romance has run its course and no amount of untimely showers and ‘accidents’ on purpose can infuse the magic back into their lives; our lives. 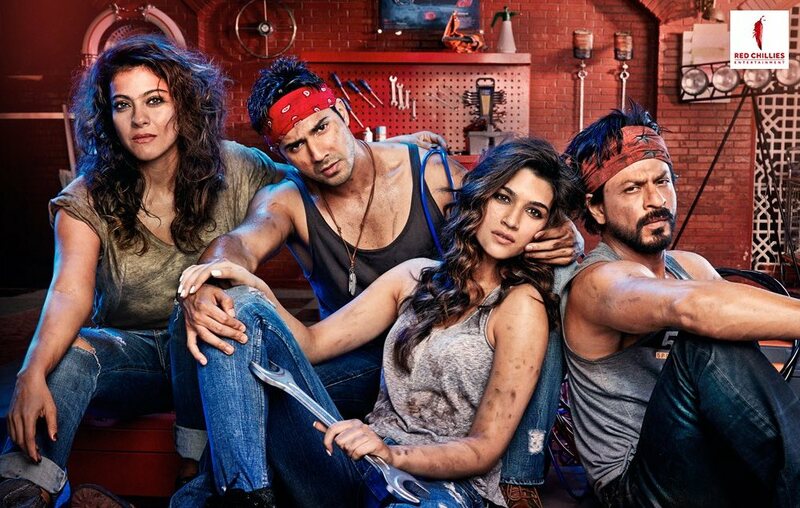 Like most Shetty films, Dilwale is set in a set that does a good job of reminding you that it is one- right from Kali’s garage (he’s a car modifier) to a chai shop outside his house. The film starts with a blooming love story between Veer (Varun) and Ishita (Kriti). It takes the two precisely two dates and some very unwitty banter for them to realize that they’re made for each other. By the seemingly third date, it’s time to tell their families – Kali (SRK) is Veer’s brother and Meera (Kajol) is Ishita’s sister. It is this relationship that brings together the two ex flames and opens a flurry of memories and dark instances in the past that have been bottled up for 15 years. From here on, the film runs back and forth playing the flashback and the present track. The current deals with two mature, civilized older siblings looking out for their younger brother and sister while the flashback delves into the characters’ dark sides replete with all things that make Rohit Shetty happy. There are cars on steroids, glass shattering punches and mind-blowing blows. Add to the story another bad guy, King (Boman Irani) who straddles between playing a powerful drug Mafioso one hand and a guy who can be taken for a ride by Johnny Lever on the other. Adding to the comedy caper is (Oscar) Sanjay Mishra who plays a quirky second-hand car parts dealer. Mishra’s impeccable timing is a shot of much-needed espresso in the film and is the only real comedy among the ones trying their hand at it – including Varun Dhawan and Varun Sharma. The jokes would best make a fifth grader chuckle. Performances by SRK and Kajol are strong, but they seem like a misfit in the film because any semblance of maturity breaks the pattern you've grown reluctantly comfortable with. What does make the film worth your while at some point is a few breathtaking shots and sequences shot against ridiculously gorgeous backdrops. The thing about Dilwale is that it over promises and under delivers. In a bid to chase the Bollywood success formula of a masala flick, which Rohit Shetty undisputedly has cracked over the years, this film tried to pack too many punches in one. As a result, none are strong enough.